রবার্ট ম. লা ফোলেটটা হ্র. 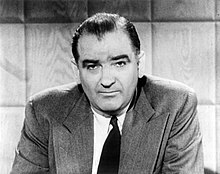 ↑ The American Heritage Dictionary (2000) defines "McCarthyism" as "the practice of publicizing accusations of political disloyalty or subversion with insufficient regard to evidence" and "the use of unfair investigatory or accusatory methods in order to suppress opposition". Webster's Third New International Dictionary, Unabridged (1961) defines it as "characterized chiefly by opposition to elements held to be subversive and by the use of tactics involving personal attacks on individuals by means of widely publicized indiscriminate allegations especially on the basis of unsubstantiated charges".